Frequent fliers will have an easier time using their rewards while booking travel plans for the summer and fall, thanks to more flights offering open reward seats. According to the latest Switchfly Reward Seat Availability Survey, released in conjunction with IdeaWorks on Wednesday, of more than 7,000 domestic and international flights that are scheduled from June through October, 76.6 percent offer reward seats. That's the highest percentage of seat availability in the seven years the survey has been conducted, and is 2.6 points higher than last year. It's also well off the low hit in 2010, when the percentage of available seats was just 66.1 percent. "I would say it is getting easier, especially if you live outside the United States," said Jay Sorensen, president of IdeaWorks. "I think the airlines have realized that for too long they have been too stingy with rewards on these long-haul routes." 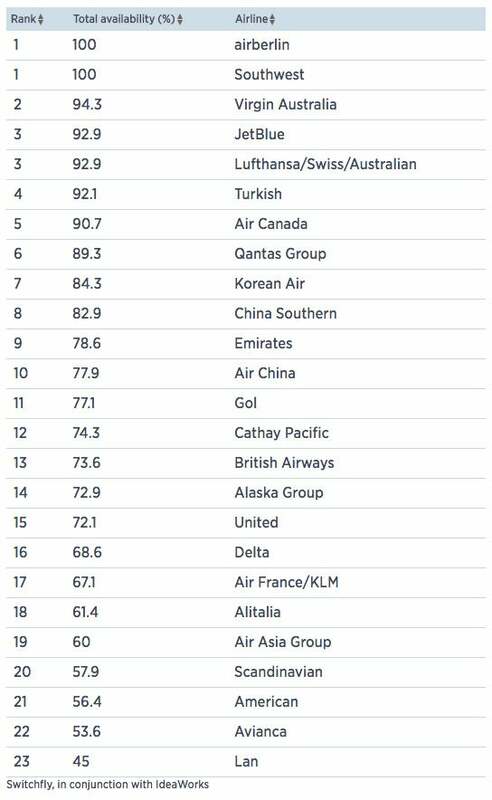 Airlines decide how many seats to free up for reward travel based on the overall profitability of a particular flight. For example, the first flight from Chicago to New York City on a Monday morning is likely to have high demand from paying customers, so carriers may decide to offer no seats for reward bookings on that flight. By comparison, demand is typically much lower for a flight between those two cities in the middle of the day, so an airline could decide to make some seats available for frequent fliers. As for international flights, Sorensen said the greater availability of seats reflects the routes' growing importance to airlines' most loyal customers, who tend to fly more often and therefore rack up more miles. "Perhaps what these programs are doing is they are beginning to cater more to their ultra-frequent fliers," he said. The Switchfly survey found some carriers, namely Southwest and the German discount airline Air Berlin, had reward seats available on every flight. "I think they [Southwest] have made a conscious effort to manage their program better in terms of being concerned about reward seat availability and really increasing reward seat availability at the expense of selling that seat to a fare-paying customer," Sorensen said. Others, including American Airlines and Chile-based Lan, offered open seats on closer to 50 percent of surveyed flights, putting them at or toward the bottom of the list. The survey found open reward seats on just 56.4 percent of the American Airlines flights it inquired about, down 10.7 points compared with last year. Sorensen said American's AAdvantage frequent flier program, which has 100 million members, may not have received as much attention from the company as it should have, as American and US Airways were preoccupied with their merger over the last few years. "American achieved a herculean effort last year by merging two massive airlines with really no major problems," he said. "I think they devoted all their energy into that and I think that projects like the AAdvantage frequent flier program somewhat took a backseat in terms of innovation." American Airlines spokesman Josh Freed says the number of AAdvantage redemptions climbed 5 percent last year. "The percentage of our customers traveling on award tickets rose as well," he said. "Also, the number of MileSAAver redemptions rose last year, showing that people are finding availability at our lowest-mile award levels."